The following statement was published on the Public Notices section of theCitadel forums and refers to the Minmatar npc milita corporation which is receiving special status that exempts it from the normal npc corporation rules. The minmatar npc milita corporation, Tribal LIberation Force, is to be treated as a player corporation in the case of KOS questions. With the falling of the main Red.Overlord systems and the mass evacuation of their assets from Null Sec, WildCard Trek of Corp 54 saw a potential opportunity to acquire the catch system of ERVK-P for Operation Deliverance. After receiving official blessing, Wildcard approached the R.OL corporation who owned ERVK-P and offered to purchase the system (paying for the TCU and IHUB). 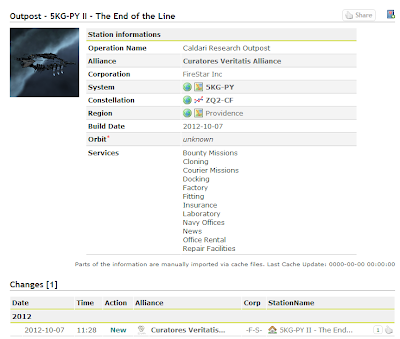 ERVK-P had served R.OL and other Southern Coalition alliances as a cyno chain link, providing a vital link for deep south entities to low-sec. After quick negotiations the owning corporation in Red.Overlord agreed and on the 9th of October dropped sovereignty and seeded the TCU and IHUB to Corp 54 of CVA. Within hours of the onlining process being started, north catch entity Cha Ching PLC took notice and began to interfere. First by starting the online procedure on a TCU of their own in system and by bringing a 30-40 man drake fleet into system to begin engaging the 54th TCU. 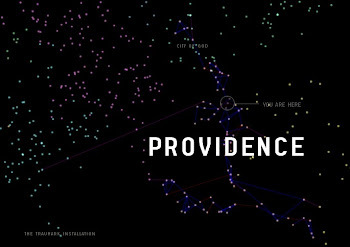 Providence forces formed immediately with CVA fielding an armor oracle fleet and -7- deploying a reinforcing drake fleet. Opting to travel conventionally instead of by the accustomed titan bridge, CVA forces arrived in system and drove the Cha Ching forces from the CVA tcu where they had been attempting to incapacitate a warp disruptor on the guarding POS. The combined Providence forces quickly routed Cha Ching, inflicting over twenty causalities for now losses. (http://kb.cva-eve.org/?a=kill_related&kll_id=249278). Several hours latter Cha Ching made a second attempt at disrupting the onlining process of the TCU and were similarly beaten (http://kb.cva-eve.org/?a=kill_related&kll_id=249299). After these two engagements the TCU and IHUB were safely onlined and the system secured, increasing the 54ths holdings in Catch to three systems. ERVK: Update station was flipped at the end of October 16th. System fully under CVA control now. On October 7th, Firestar Inc. opened the newest CVA outpost, "The End of the Line" in the dead end system of 5KG-PY of the QBL pocket. Reverend Cutter from Deus Fides Empire was once again there to preach and bless the new outpost. Hello and good day everyone. We are here to bless this, the newest station in Providence number 60! and of course celebrate that once again we have proven that our way of life is the only way that one should live among the stars. Happy in obedience to God, The Empress, the Theology Council, CVA, the Holders and our system of NRDS. These things are of course the legs or columns if you will, of which our way of life is built. The call of reclaiming illuminates my heart every single day that I breathe and for sure that must be your goal also. Service to God the Empire and the Empress is what we all strive for, whether you are Amarrian, Caldari, Gallente, or Minmatar! What does this mean for you? As we all know, we live in trying times right now. We have seen great upheavals in the large coalitions of the north and the south of us, but I can tell you now in our present situation that we are profiting from these times. They teach us to trust our Ways, humble ourselves before God, and the Empress, to turn with unfeigned Repentance and Praise GOD in every system we have. God’s judgments, given to us through the Empress and the Council show us that no other way of life or system of determining who is hostile works, or is even worthy of our attention. Maybe you do not believe me? CONSULT your Conscience, and then tell me---Should we not hearken to the Voice of God, speaking to us in his Judgments, and calling us to our destiny of reclaiming? Can we look for his Favor or Pardon, if we stop now or change our trusted ways? Or expect his Blessing, if the Cry of our Sins continues to enter his Ears? Would it be right in us to repeat or multiply our Transgressions, when all that is dear to us, or valuable in this universe, is at Stake? I TRUST that these Considerations will sink deep in our Minds, and produce suitable Effects. Let us not defeat his gracious Designs to reclaim and save us all. Sincerely lamenting our past Sins, which have been committed against the clearest Light, the dearest Love, and the most transcendent Mercy, let us prostrate ourselves before God, implore his Pardon and then by his Grace, to amend hereafter, to worship him, and walk devoutly only in his Ways, do only his bidding so that eternal God, be ascribed immortal Praise, Glory, and Dominion, henceforth, and for evermore. This marks the 60th Outpost to be constructed in the region of Providence. 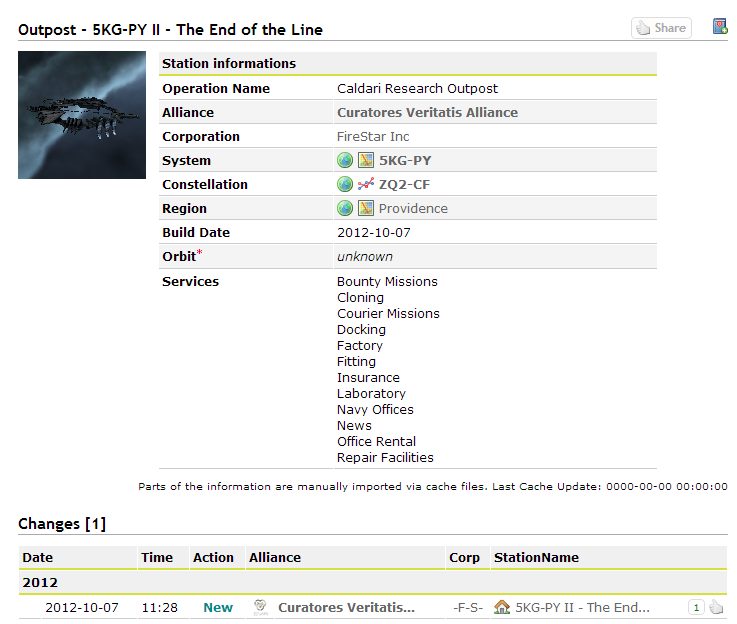 The Following is an After Action Report following action in the star system of Sieh on October 6, 2012. Originally posted on theCitadel Forums. First I'd like to thank Hidetoshi and theLadio and the guys who joined their quick tempest fleet for coming up and helping us. That could have gone very poorly if you hadn't formed quickly and shown up. It started with a ping amongst a few people by Tinator from Excon (PILL) wondering if there was any interest in getting some people on standbye. A neutral POS had been reinforced in Sieh by some KOS folks who had a history of killing POS' with capitals. I said sure and got a few IG caps on standbye and in fleet as well as a few other CVA folks, mostly out of *censored*. POS came out of reinforced but hostile corporation only showed up in a bs or two and a drake to shoot the tower. After waiting a bit PILL warped in a few battleships and killed the drake than left the tower to the sun were they waited to see what would happen next. After a bit a second neutral group (RELOADED DOT) cynoed two carriers and some support and started repairing the tower. While we were running a quick test to determine if these folks were KOS (or needed to be KOS) our BS in system warped to the POS than warped out to see how reloaded would respond. Just as Awg went "they killed a CF guy so probably should be KOS" they attacked Tinator's battleship, and it was on. Things quickly escalated as their support became 10-15 battleships and a couple logis. Initially didn't bring any capitals in because they had a lot of battleship on the field but Tinator quickly decided to bring a triage and when I offered I also came in in a triage Archon. For the next twenty to thirty minutes three battleships and two triage Archons faced off against two Thanatos and about 20 BS and logi support with neither side able to break the tanks of the other side. With about twenty minutes of triage left and no real end in site I started pinging P-FC to see if someone could form quickly and turn the fight for us. Hidetoshi nearly immediately said sure and he and theLadio formed about 30 tempest + logi support for us. In Sieh we were fighting around this pos. I had come out of triage off and on a few times and managed to wander about 70k from our other triage archon. Seeing how far off I was hostiles pulled their battleship fleet over to me and forced me back into triage. However they refused to move their thanatos which they were not triaging, meaning their battleships were being pulled out of thanny repair range. This move finally allowed us to take down a person or two. Around the same time I was getting down to about three triage cycles left and getting a little paranoid. We had been on the field for almost 40-50 minutes. I asked Hidetoshi to just burn instead of waiting to sort the titan bridge (in retrospect a mistake as we likely could have killed a bunch more). Tinator brought a fourth battleship onto the field and cynoed in three-four extra carriers who brought in some extra stront for me. At this time we assume the hostiles had spotted the Tempest fleet inbound. They started retreating towards the POS. Despite our best efforts they managed to get their carriers inside the shields just as the Tempests entered Sieh. We decided to kill the pos because we could and the tempest fleet started shooting. In order to speed it up we did a quick ping for dreads and managed to pull a decent number in under five minutes. Just as we lite the cyno for the dreads a known RnK cyno entered system. Tinator pulled all the caps off the field and we let the battleships quickly finish off the pos alone. While that was going on we managed to get eyes in Nakah to find RnK not forming (so we likely would have been okay) but things worked out in the end. 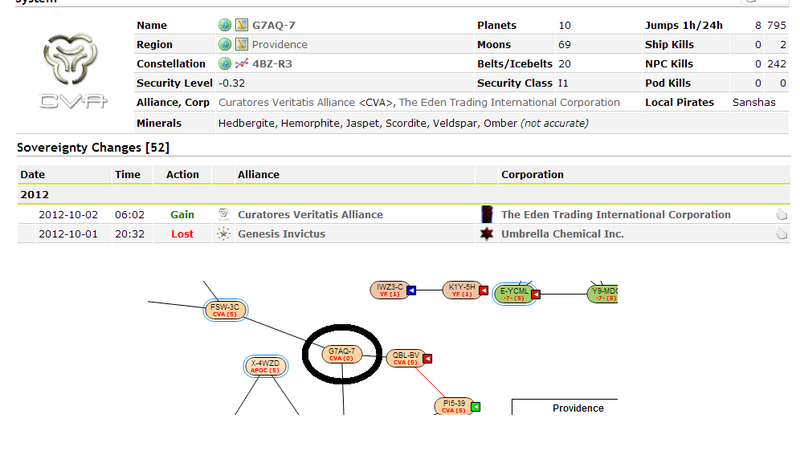 Lost 2 Geddons and an Abaddon during the inital engagement before triage entered the field. Killed Drake, Hound, Tornado, Abaddon? and the control tower + Mods. Probably the funnest fight i've had in ages, even though there weren't many kills it lasted a long time. There is something about fighting five against 20+ and coming out okay that is just thrilling. So again, thank you tempests for coming to the rescue, from me and the "For Medicinal Use Only" crew. Killmails will be forthcoming when I can find time while eve-kill is actually working to sort links. Early this morning TETIC recovered the system G7AQ-7 whose sovereignty had been dropped by Holder Genesis Invictus. Rumors of potential trouble within the alliance had been forthcoming for some time. Regional participation had taken a noticeable decline in the last months with little to no intel being reporting from G7, a vital crossroads system at the entrance to the QBL pocket. Several inquiries into the status of the alliance had been forthcoming from high-ranking TETIC members who own two of the three neighboring systems and had noted the security hole stemming from G7AQ-7. After the sov. drop in G7 it is reported that ZombieFX, leader of Umbrella Chemical Inc. booted the remaining corporations from Genesis Invictus and closed the alliance down. While not confirmed it is believed that some GNS members will be joining TETIC who now hold sovereignty in G7AQ-7. Holders and Providence entities are reminded to remove standings to the now closed Genesis Invictus alliance.